The property landscape is littered with casualties of the mining town “hot spot” phenomenon. Property investors were chasing the quick buck, but now values and rents have plummeted leaving many with negative equity in their highly geared properties and much lower rents to service their loans. Recently Propell Valuers reported that the end of the mining boom is nowhere more evident than in house prices in remote mining communities in their Carnival is over: house prices in mining towns now the boom is gone report which provides a detailed look at mining towns and the outlook in the new world of lower mining employment demand. Further declines are on the horizon, the report forecasts with the worst affected towns have the equivalent of three to five years’ worth of stock on the market for sale. They say buying a house in a mining town is not so much a real estate decision, as a futures play on the global commodities market. Value depends on rent, which depends on accommodation demand for employees working on a resource project. When commodity prices halve, as they have in 2014, mines will shut down and houses, once in heavy demand, can lie empty. Even if demand is solid, the value van be eroded in other ways. Developers, lured by high prices, will develop new supply that can reduce rents. “Gladstone is the largest, with 8,900 houses. It is the port city for the Bowen Basin, within which are also Emerald, Moranbah and Blackwater. Together, these towns have been the worst affected. For these six towns, the number of house sales has dropped by half. There were almost 3,000 sales in 2011, as optimism about mine expansion and the dredging of the harbour to provide new port facilities reached its height. 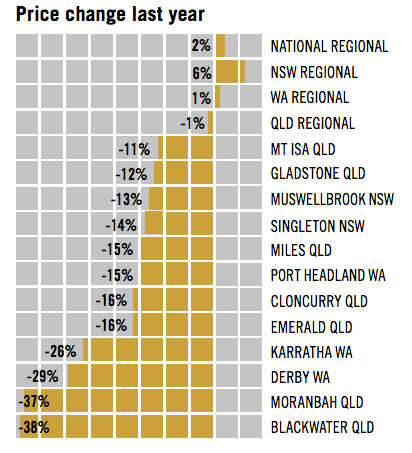 In NSW Muswellbrook was the most affected town, with a fall of 13 per cent in 2014 – a figure “that seems almost mild in comparison” to what’s happening in other states, according to the report. In Karratha, at the hub of Western Australia’s expansion and with almost 3,400 houses, turnover has fall some 45 per cent with prices down 12 per cent in 2013, followed by 26 per cent in 2014. The report warned that “one-industry” towns were obviously more susceptible to the downturn and would suffer more rapidly and severely. “Like the ghost towns of old from the days of the gold rush, they boom while there is money to be made, then disappear. Further declines are on the horizon, the report forecast. The worst affected towns have the equivalent of three to five years’ worth of stock on the market for sale and it is a buyers’ market.